For the last week, the Grade 10 Art class has been working hard molding their medieval inspired clay sculptures. They have learn new sculpting techniques like coiling and pinching, while taking inspiration from medieval gothic architecture. With Coffee House coming up soon, Mrs. Tracy Cobus and a group of her students will be displaying some student artwork for the public to view on the night of the show. Any students interested in displaying some of their work are asked to go to Room 205 to speak to Mrs.Cobus. All are welcome! The Coffee House is once again coming up on Thursday, May 4. Volunteer decorators are needed to make “The Coffee House experience” complete. Any students interested in helping with decoration can sign up on the door of Room 310. For further information and assistance report to Mr. David Rowat or Mrs. Tracy Cobus. During the week of April 30 – May 5 Catholic Schools across Ontario will once again celebrate the special opportunities offered to its students in fostering each person’s faith. The Catholic Women’s League of St. Francis Xavier Parish is sponsoring a Catholic Education Week Poem/Artwork Contest. All students from grades 8-12 can participate and 1st, 2nd, and 3rd place submissions win a cash prize. Submissions are due on Friday, April 21st. Please see Mr. Dedo in Chaplaincy Services for more information. After months of planning, Mrs. Tracy Cobus and a group of her Art Club students put the first stroke of paint on the five 4″ by 8″ canvases for the school mural that will be hung in the student lounge for all to enjoy. The school mural will feature our sister school in the Dominican Republic and will be inspired by the many memories that the Dominican Republic Experience teams have been blessed to experience. Art Club students, Julia McCuaig and Cassandra Monk, begin the first coat of paint. Tired of the 2-D world? Art teacher, Tracy Cobus is proud to announce the beginning of the NEW 3-D Printing Club! The club will be held on Tuesdays at lunch in Room 221. Students will be given the opportunity to put their creativity to use as they begin to interact with the new technology. All are welcome to join! Throughout the past few days, the Art Class has been working on their Linoleum Block Art. Most of the students have progressed to the cutting stage. They use a sharp tool to cut into the linoleum, to make their prefered designs. They are all progressing very well! Here, we have Madison Maika working on her art. The Beginning of the Inuit Lenoleum Block Art. 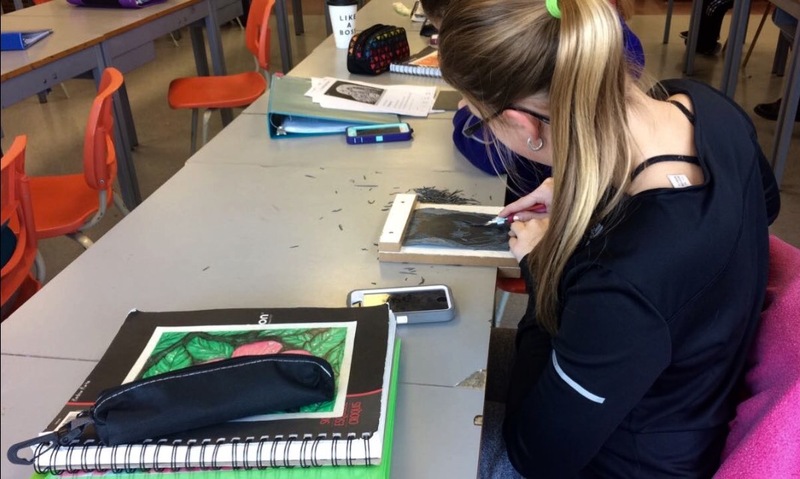 Today, The Grade 9’s are working on their Inuit Linoleum Block sketches. They choose a design from the Inuit art, and make their own design . Using a cutting tool, the students scrape the Linoleum block into the designs they want. Later, they will print them off onto paper. The students are excited for this project! 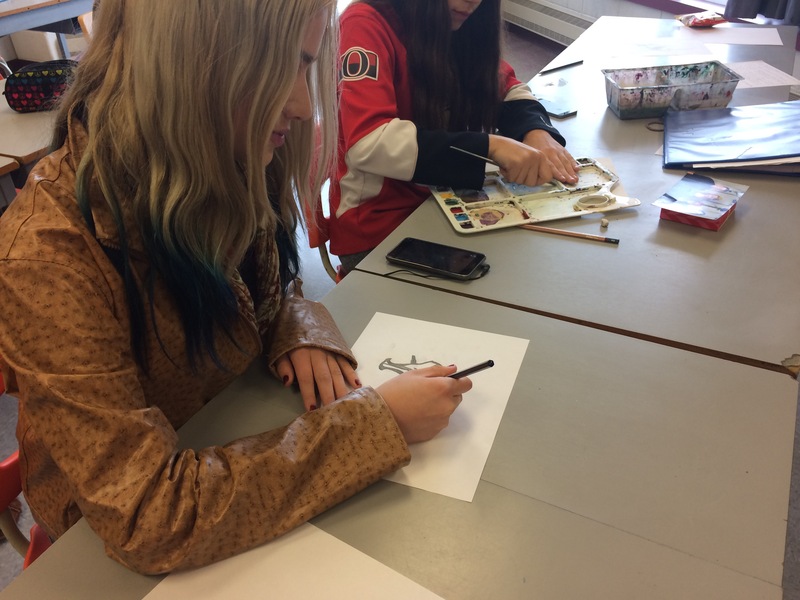 Rebekah Broughton, sketching a fish for her Inuit Linoleum Block! Today, some of the students from the Art Class are painting the Nativity Christmas cut outs for a play, using black paint. 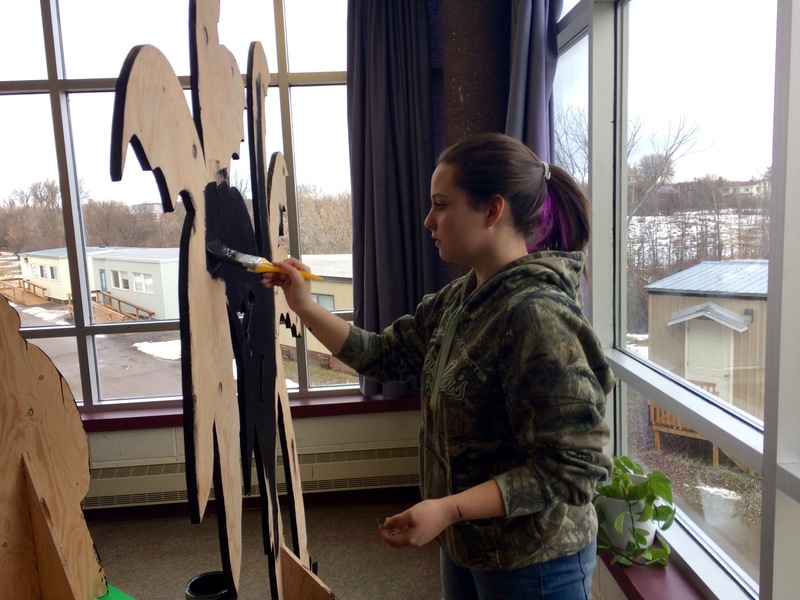 Shanna Beauchamp of Grade 9, painting the cut outs.